Hungarian capital is one of the most cuisine-diverse cities in Europe. Here you can find food for all tastes and paychecks. But sometimes you just don’t want to spend much and want to get a geat food quality for a modest budget. Let us focus on the TOP 3 best cheap eats in Budapest to help you with your food planning. A legend among Budapest budget food places, Frici Papi is a bistro that serves traditional Hungarian meals for a budget price. The portions here are big, the quality of food is great. Also, during the working days, they usually have the Napi Menü (daily menu) so you can save even more money and get nice Hungarian meals. Nice, budget place serving good quality Hungarian food. Not too cheap, not too fancy. Great place to taste the famous Hungarian Goulash soup! It is among the best cheap eats in Budapest. Currently having the proud first place on TripAdvisor among the Budapest cheap eats. And this is for a reason. This GasztroBar serves tasty food for reasonable price. Everything very fast and with no doubt delicious. King of cheap eats in Budapest! TIP OF THE TIPS FOR FINDING CHEAP MEAL IN BUDAPEST! Budapest restaurants have the magical thing called Napi menü which stands for Daily menu or lunch in other words. I know I know, it’s in Hungarian. But don’t get upset too soon. Let’s clear the things up. 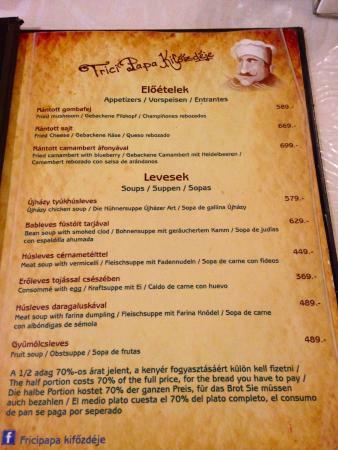 Looks confusing, Hungarian names of the food is not something you know outside Hungary. But also it is a great way to discover more about the local food proposition.